Jim Self (b.1943) holds the DMA degree from the University of Southern California where he currently teaches tuba and chamber music. As a renowned tubist he has performed in more than 1000 soundtracks for motion pictures and television. In addition to the Los Angeles Opera, he is also a regular member of the Pasadena, Pacific, and Hollywood Bowl orchestras. His compositions and arrangements, for a wide variety of soloists and ensembles, have been performed and published worldwide. His music and recordings are available from: http//www.bassethoundmusic.com. For many years I have coached brass quintets at the USC Thornton School of Music. One of the outstanding young quintets kept urging me to write a quintet for them and thus was born HoopLA. This short one movement piece was premiered by them in April 2014. It was during this same time that I was writing two other works, Intrepideedoodah and Pocket Change. In all three I used 6/4 meter as the main rhythmic structure. I call it my 6/4 “period.” That meter translates easily into 12/8 and many other groupings of 2s, 3s, 4,s and 6s—the glories of hemiola abound. A unison intro leads to a Latin set-up in the trumpets and a tricky groove in the trombones. The horn has a haunting melody over that. A middle waltz section follows with imitative solos in the trumpets and a series of duets between the all of the players—giving the impression of odd meters. The main theme returns with a rousing ending. 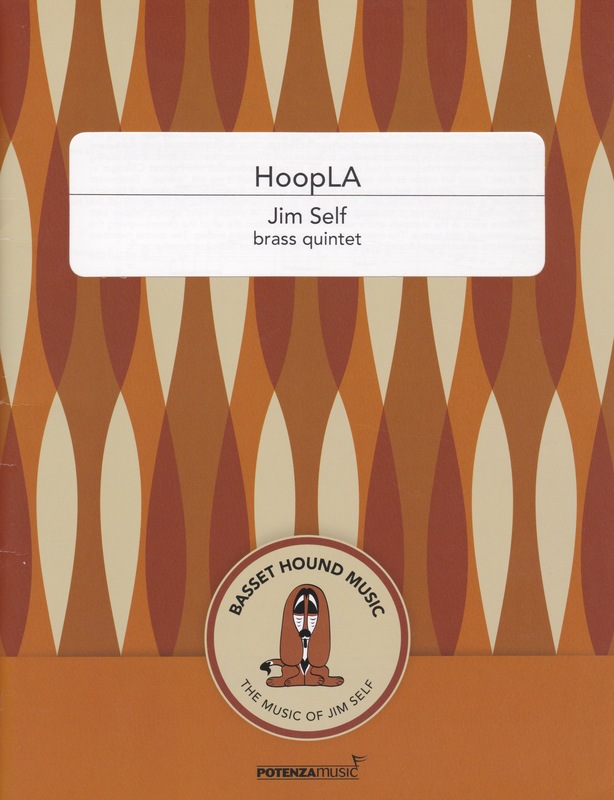 The brass quintet members named the piece HoopLA and, as the title suggests, it’s a lot of fun in Los Angeles. This is good music that is melodically and harmonically tonal, interesting rhythmically, with all parts sharing in the spotlight. As would be expected from a brass player/composer, the parts are idiomatic and the work is playable by a good undergraduate quintet. It is also sophisticated enough for professional ensembles looking for something other than the usual arrangements. It can serve as an excellent opener or encore on a recital.